Real Mode Segmented Model, Cont. The Protected Mode Flat Model Diagram, Cont. strictly converting one address value into a physically meaningful location in the RAM. strictly converting two address values into a physically meaningful memory location. gives access to one megabyte (1,048,576 bytes) of directly addressable memory, known as real mode memory. Segment registers are basically memory pointers located inside the CPU. Two-component specification is called logical address, also called effective address. Logical address translates to a 20-bit physical address. 4. Real Mode Segmented Model, Cont. Since an offset cannot exceed 16 bits, you cannot increment beyond 64k. Instead, program must watch out for a 64k boundary and then play games with the segment register. This nightmare was originally created to support CP/M-80 programs ported from 8080 chip to 8086. Catastrophically bad long-term thinking that resulted in never-ending Windows 9x problems! within one megabyte of memory. For compatibility reasons, Pentium CPU is capable of switching itself into real mode segmented model, is effectively becoming a good old 8086 chip! 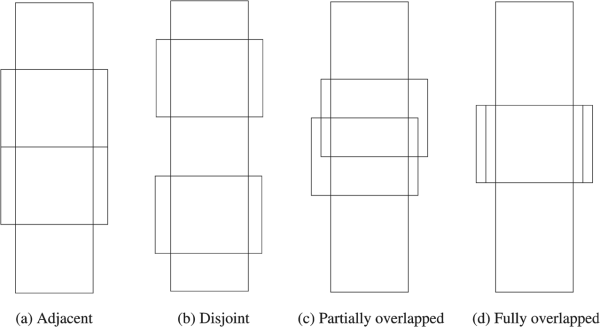 (*) Paragraphs are almost never used, except in connection with the places where segments may begin. Any memory address evenly divisible by 16 is called a paragraph boundary. The first paragraph boundary is address 0. The third address is 20H, and so on. Any paragraph boundary may be considered the start of a segment. There are 64K different paragraph boundaries where a segment may begin. Each paragraph boundary has a number. Any segment may begin at any paragraph boundary. The number of the paragraph boundary is called the segment address. Assembly language program can have up to four or five segments. 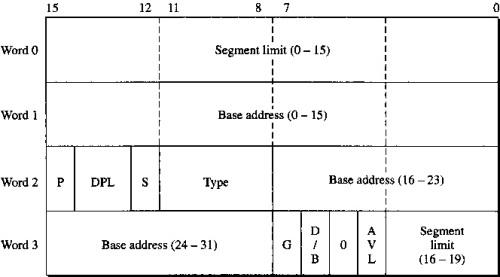 Segment address is 16 bytes in size. Every byte of memory, accessible by program, is assumed to reside in a segment. Segment size varies and can range from 1 byte to 64 Kbytes. Nothing is protected within a segment in Real Mode. 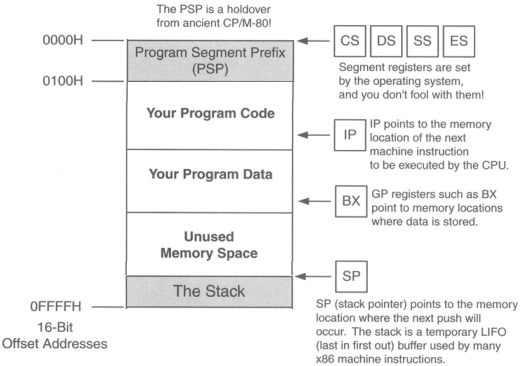 Recall that 8086 and 8088 CPUs had 20 address pins, limiting a program to 1 megabyte of memory. and the offset address in another 16-bit register. plus distance between the byte and the segment start. The byte's distance from the start of the segment is referred to as the byte's offset address. SEGMENT:OFFSET addresses are always written in hexadecimal notation. 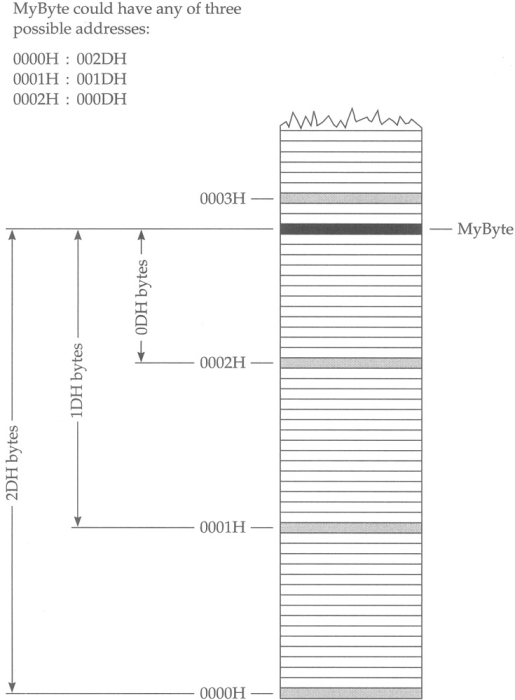 For example, an address of one byte of data MyByte is given as 0001:001D. This means that MyByte is in segment 0001H and is located 001DH bytes from the start of that segment. 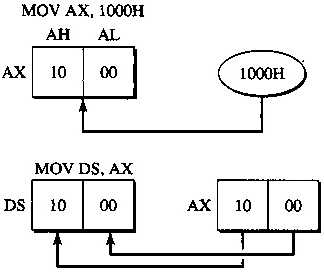 Since segments can overlap, same byte could also be located by SEGMENT:OFFSET combinations 0002:000D or 0001:001D. The 8088, 8086, and 80286 CPUs have four segment registers to hold segment addresses. The 386 and later CPUs have two more, also available in real mode. Note: the 386 and later Intel x86 CPUs still use 16-bit size segment registers. Each segment register is 16-bit in size. CS, DS, SS, ES, FS and GS. CS, code segment. Machine instructions exist at some offset into a code segment. The segment address of the code segment of the currently executing instruction is contained in CS. DS, data segment. Variables and other data exist at some offset into a data segment. 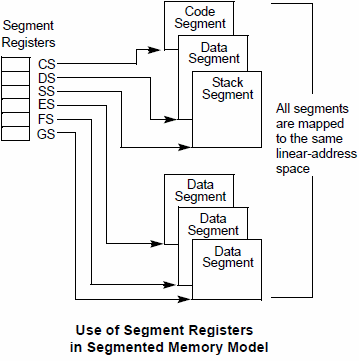 There may be many data segments, but the CPU may only use one at a time, by placing the segment address of that segment in register DS. SS, stack segment. The stack is a very important component of the CPU used for temporary storage of data and addresses. Therefore, the stack has a segment address, which is contained in register SS. ES, extra segment. The extra segment is exactly that: a spare segment that may be used for specifying a location in memory. 13. Segment Register Names, Cont. FS and GS are clones of ES, the extra segment. FS and GS both are just additional segments, no specialty here. Names FS and GS come from the fact that they were created after ES: E, F, G.
They exist only in the 386 and later x86 CPUs. 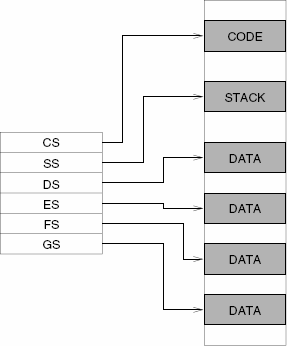 Extra segments ES, FS, and GS can be used for both data or code. 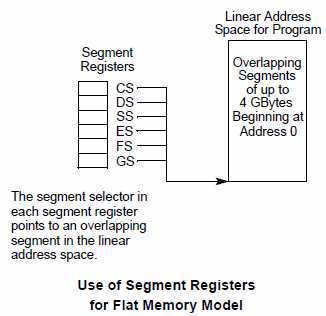 offset addresses that must be paired with segment addresses to locate data in memory. Pentium can turn off segmentation. A segment becomes active by loading its descriptor into one of the segment registers. CPU can see only 1 megabyte (1,048,576) of memory. 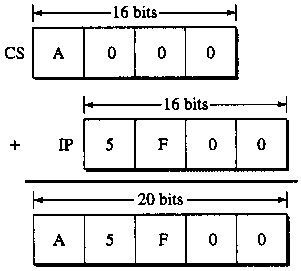 segment:offset pairs form a 20-bit addresses out of two 16-bit addresses. In real mode flat model a program and all its data must exist within a single 64K block of memory. The real mode flat model is similar to protected mode flat model, the code model used on Linux and Windows XP/Vista. The segment registers are all set to point to the beginning of the 64K block of memory. The operating system sets segment registers when it loads the program. All segment registers point to that same place. Physical segment assignments never change as long as the program is running. The segment registers are still functioning, but no work with segments is required. Real mode segmented model was mainstream programming model throughout the MS-DOS era. Used when Windows 9x machine is booted into MS-DOS mode. Good choice to write code to run under MS-DOS. Program has access to 1MB of memory. The CPU handles transformations of segment:offset combinations into a full 20-bit address. 20. Real Mode Segmented Model, Cont. The next instruction to be executed is pointed to by the CS:IP register pair. Machine instructions called jumps can change CS to another code segment if necessary. The program can span several code segments. when a jump instruction needs to take execution into a different code segment, it changes CS value for you. 21. Real Mode Segmented Model, Cont. There is only one stack segment for any single program. A program has potential to destroy portions of memory that does not belong to its process. Careless use of segment registers will cause the operating system to crash. On 32-bit processors, Windows and Linux use the so-called protected mode flat memory model. 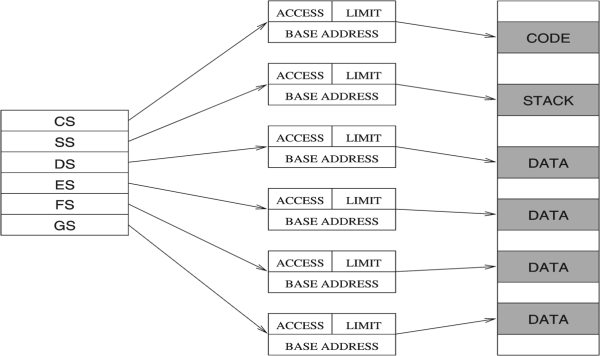 entire address space is described by a 32-bit segment, which provides 232 = 4 gigabytes of address space. program can (in theory) access up to 4 gigabytes of virtual or physical memory. segment registers contain selector values rather than actual physical segment addresses. Selector values cannot be calculated by the program; they must be obtained by calling the operating system. Programs that update segment values or attempt to address memory directly do not work in protected mode. 32-bit Protected Mode supports much larger data structures than Real mode. Because code, data, and stack reside in the same segment, each segment register can hold the same value that never needs to change. Rather than using a formula (such as CS:IP) to determine the physical address, protected mode processors use a look up table. Segment registers simply point to OS data structures that contain the information needed to access a location. Protected mode uses privilege levels to maintain system integrity and security. Programs cannot access data or code that is in a higher privilege level. 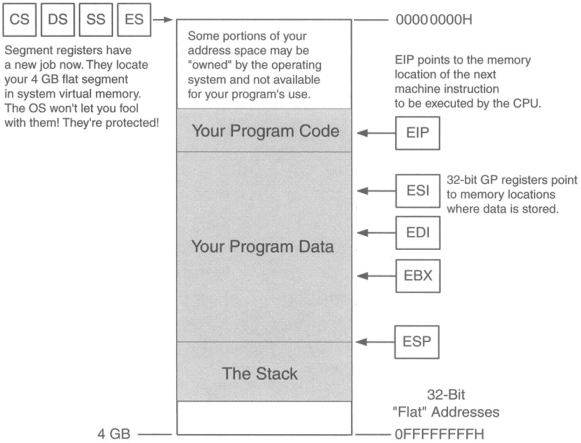 EIP can indicate any machine instruction anywhere in the 4 GB of memory. The segment registers are now considered part of the operating system, you can neither read nor change them directly. 25. The Protected Mode Flat Model Diagram, Cont. When 32-bit program executes, it has access to 4-gig address space. 26. The Protected Mode Flat Model Diagram, Cont. Attempting to actually read or write certain locations in your own program can be forbidden by the OS and will trigger an error. Challenges in programming for protected mode flat model are based on understanding the operating system, its requirements, and restrictions. Application programs cannot make use of protected mode by themselves. The operating system must set up and manage a protected mode. Capability provided by Linux and Windows NT/2000/XP/Vista systems. Each address is a 32-bit quantity. All of the general-purpose registers are 32 bits in size. An easiest way to write protected mode assembly program under Windows is to create console application. Console application is text-mode program that runs in a text-mode window called a console. Console applications use protected mode flat model and are fairly straightforward. The default memory mode for text console app under Linux is also protected mode. Segment registers are called selectors when operating in protected mode. In protected mode, segment registers simply point to data structures called segment descriptors that contain the information needed to access a physical memory location. 13-bit index field selects one of 8,192 segment descriptors. IDT - interrupt descriptor table. RPL requestor privilege level - 2-bit field, specifies if the access to the segment is allowed. Some instructions that directly access ports or affect interrupts (such as CLI, STI, IN, and OUT) are available at privilege levels normally used only by systems programs. Several LDTs may exist for a program. 3. Interrupt descriptor table IDT, used by interrupt processing. Understanding segments is an essential part of programming in assembly language. (b) 4 gigabytes for 32-bit processors. A variable-sized block of memory, called a logical segment occupied by a program's code or data. 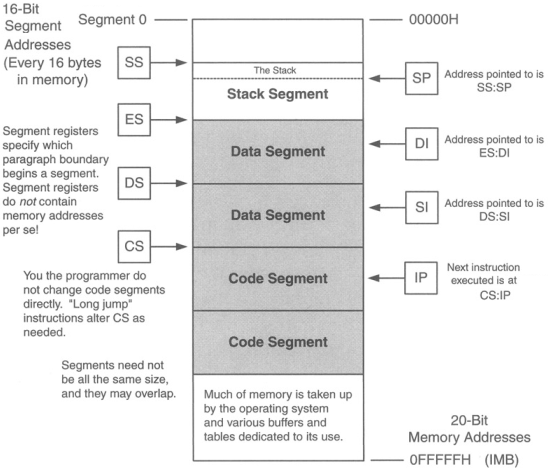 Segmented architecture presents certain hurdles for 16-bit assembly-language program. code and data each occupy less than 64K and reside in individual segments. a simple offset locates each variable or instruction within a segment. If data occupies two or more segments, the program must specify both segment and offset to access a variable. When the data forms a continuous stream across segments, such as the text in a word processor's workspace, the problems become more acute. Whenever it adds or deletes text in the first segment, the word processor must seamlessly move data back and forth over the boundaries of each following segment. Although segments still exist, they easily hold all the code and data of the largest programs. Even a very large program becomes, in effect, a small application, capable to reach all code and all data with a single offset address.